Mr. Bill’s Pipe and Tobacco has been a Las Vegas staple since 1980, winning the local “Best of Las Vegas” contest year after year.The company takes pride in providing exemplary service to its customers while offering a vast inventory of pipes, pipe tobacco, imported cigarettes, hand rolled premium cigars, hookahs, tobacco and accessories, water pipes, vaporizers, detoxification products and unique gifts— all at great prices. While Mr. Bill’s business model has proven effective, the company recognized a need for improved inventory management and overall efficiency. To satisfy this need, it recently implemented POS Express software, created by POS Prophet Systems. Mr. Bills is a multi-site business, operating out of three retail locations and a central warehouse location. Prior to POS Express implementation, managing inventory among all of these locations was a challenge. Stock levels for the individual retail locations, the warehouse and all locations. were difficult to obtain. Tracking item transfers from one location to another posed another problem. Since Mr. Bill’s is a business that aims to be the best for their customers, the company also wanted to increase overall speed and efficiency of sales transactions. 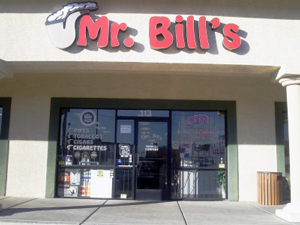 service that matches retail operators with software vendors based on business needs, Mr. Bill’s was connected with POS Prophet Systems. After working with Mr. Bill’s to identify their specific needs, Bill at POS Prophet Systems proved that POS Express was the best solution through a series of web demonstrations. To address the multi-site issue, POS Express has a Store Code feature designed for the needs of multi-site businesses. All data is placed in a centralized, secure location, enabling the administrative terminal at the warehouse, as well as the POS terminals at the retail locations to connect and access the database. This provides each location with the ability to run real time inventory reports for each individual location or the inventory totals for all locations. Sales associates can easily check stock levels at all four locations from any POS terminal. The warehouse manager can also transfer inventory and run reports to track all transfers. Since implementing POS Express, Mr. Bill’s and its customers no longer suffer from inventory inefficiency. Armed with immediate access to accurate inventory data, sales associates are more helpful and efficient. If a customer cannot find an item at one location, the sales associate can easily locate that item at another one; this increases customer satisfaction and sales for Mr. Bill’s. The POS Express retail software solution includes point-of-sale, integrated payment processing, inventory management, customer loyalty and gift card programs, time and attendance, multi-site support, robust reporting, email marketing, fully-integrated e-commerce, full food and beverage solution and much more. POS Express is a great solution for a large variety of business types. Their list of clients range from museums to independently owned book and music stores, and from air brush artists to smoke shops to family owned feed stores. They are also ideal for kiosk franchisors and operators. Their multi-site, store code features are very helpful with managing multiple locations. For more on Mr. Bill’s, click here. … … to the printer … Case Study: Optical Retailer Switches Focus from Paper to Cloud (Success stories) … credit card swipe, bar code readers and standard as well as receipt/thermal .